People are always making jokes about how no one wants a fruitcake, but - here's the thing - I really do want some fruitcake. The store-bought kind never seems to be vegan, unfortunately. 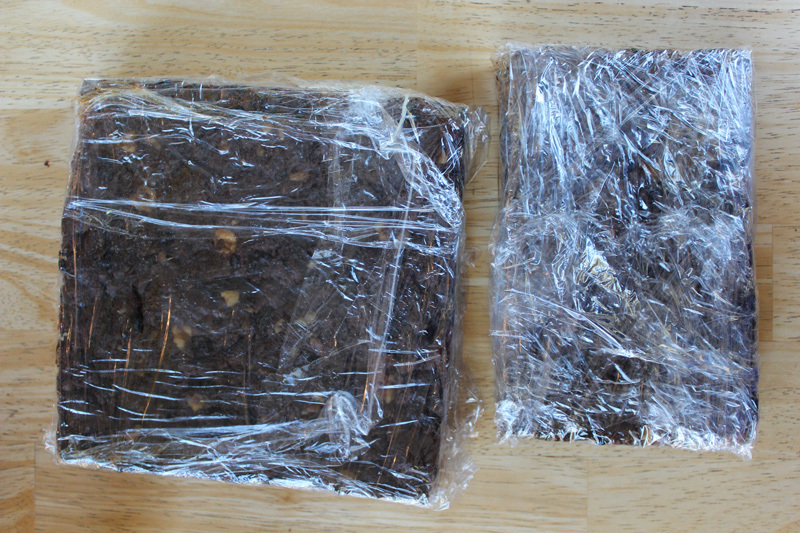 In previous years, I've often made panforte - which is essentially a dense Italian version of fruitcake. But this year, I was determined to make a proper fruitcake! I turned to a classic recipe from The Joy of Cooking. The recipe was super easy to veganize, because it didn't have any eggs and I just replaced the butter with half Earth Balance and half coconut oil. The recipe called for a few things I didn't have: a big variety of candied fruit and a 10-inch tube pan. I used a combo of one container of brightly colored cheapo candied fruit from the grocery store and then I used a bunch of nice dried fruits instead of candied fruit. I looked up some conversion charts online and used two 9-inch cake pans instead of a 10-inch tube pan. The batter was thick and was essentially pressed into the pans - which were carefully greased and then lined with parchment paper on the bottoms and the sides. look at all the nuts and raisins and goodies in there! The cakes baked for a few hours at a low temperature. The recipe said "it will look like it's done after two hours, but don't be fooled." In truth, I should have been fooled. I think maybe the cake pan conversion tip I followed wasn't spot on, because the edges of my cake got a bit overcooked. No worries, I was already planning to cut this up and divvy it up amongst people for prezzies - so I just carefully trimmed off the outer edges. After the cake is fully cooled and removed from the pans, you poke the cake with a number of small holes and pour on one entire cup of hot brandy. Oh yes I did! I love me some boozy desserts. This was a fun process. I liked deliberately poking holes in my cake and I liked watching the warm brandy disappear and be absorbed into the cake. Exciting! 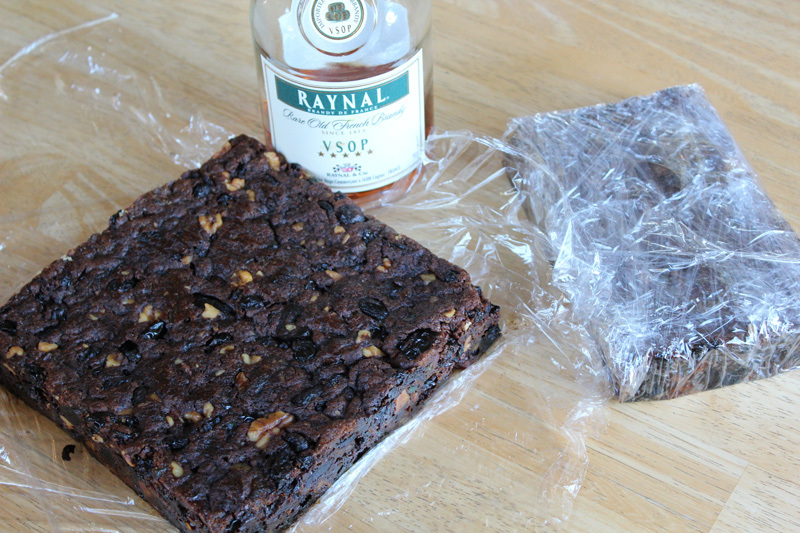 After pouring on the brandy, the recipe suggests wrapping the cakes in saran wrap - for up to a few months! Wow! I made mine right before Thanksgiving, so they have been absorbing the brandy all this time, and I have been staring at them and smelling them through the saran wrap. Of course, your keen eyes have noticed that one of those cakes in already cut in half. What a mystery!? We ate it. Ha ha. Mystery solved. I couldn't stand to wait so long to learn about this fun creation. The flavor of this cake is quite delicious - but I still feel like it's a bit rough around the edges (literally, in this case!) - and I need to continue my research on making a proper fruitcake. Do you have any favorite recipes or fruit cake tips? I am looking for a class fruitcake, nothing too nouveau or shi-shi-la-la, if you know what I mean. Bring me your fruitcake advice! ps. Sorry Mom and Dad, now you know what you are getting for Christmas. I love you! pps. Don't forget to enter my contest to win one of my annual hand-drawn Cookbooklettes! I'll be drawing a winner on Friday Dec 19th. Good luck! My mom loves fruitcake. Every year people give them to her, and then she puts them in the freezer and treats herself to small slices with coffee until all of the cake has disappeared. However, because of its bad press and now because it's not vegan, I've never tried it! I hope someone gives you some great advice on vegan fruitcakes, because then I can bake one for my mom and add it to her collection! The big cake never gets eaten and such a waste throw out after all that effort, next year I'm going to use a square tin like you and cut them down, or try to bake in cupcake molds. Mmm I skipped making a cake this year and now totally regret it! My mom loves fruit cake and I get her a vegan version from a local-ish bakery so I can eat it too. The rest of the family makes fun of us but it grows on you and gets addictive, especially with big chunks of Brazilian nuts and pecans in it. [ Smiles ] Lovely! 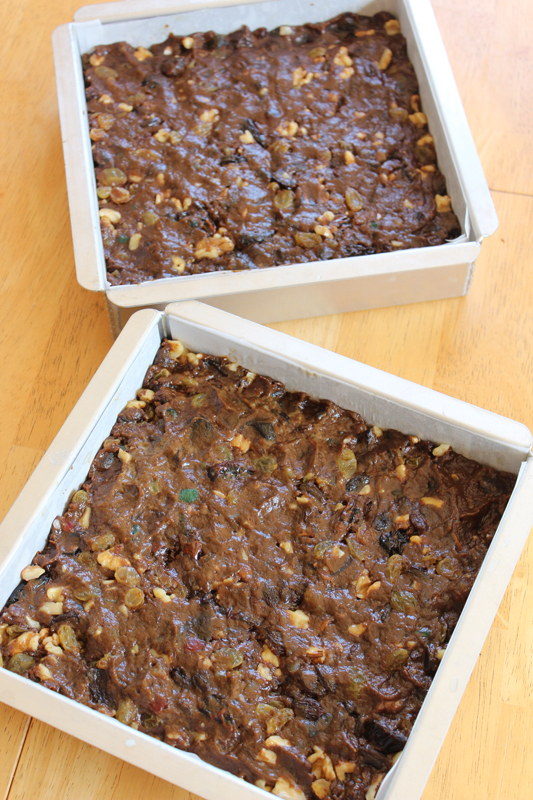 Vegan fruitcake; which will come in very handy for the Christmas Season!